During the chilly winter months, the biggest treat for most is escaping to the sunny beaches of a tropical oasis. Located 179 miles from the coast of Florida, you will find a grand version of just that on Paradise Island. Imagine descending upon the turquoise waters of the Caribbean to Nassau, Bahamas where you make your way to the docks to be greeted by your personal boat captain who ushers you over to your private, fully furnished seaside villa. This dream is now a reality, thanks to the Brennan Custom Homes architects and Sterling Financial Group. The power pair teamed up to construct five exquisite villa homes which have recently hit the market, complete with luxurious custom designs, hassle-free services and amenities that are sure to please as much as (if not more than) their mesmerizing oceanfront views. 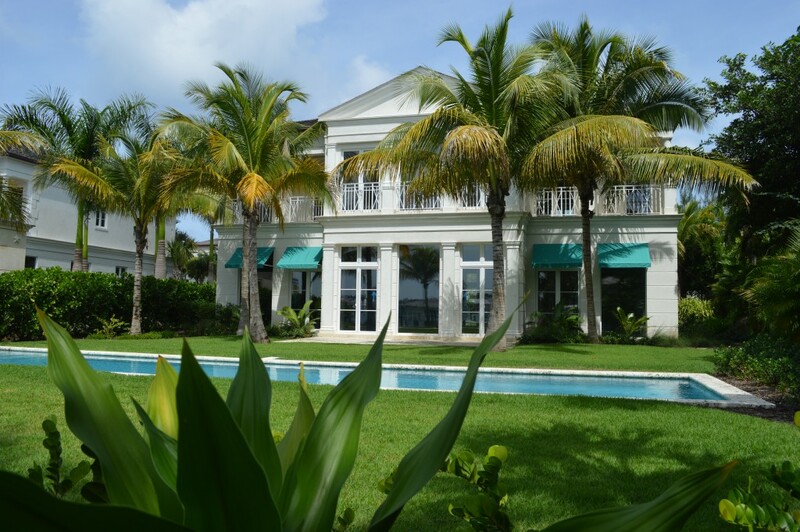 Located on the exclusive western end of Paradise Island, Bahamas from beachside to harbour side, there are several perks to the Beach House Villas. For starters, each of the five private villa homes is a portrait of modern luxury, featuring its own private waterfront pool and lush tropical landscaping with unobstructed, crystal blue water views. There are on-site maintenance employees to care for both the yard and pool, so these remain in pristine condition at all times. In addition to a private pool and garden, each villa comes packaged with a personal chef, concierge, laundry service, housekeeping, land and water transportation and a private dock which can host up to a 150-foot boat. House Villa, he/she will notice the open-air space, 12-foot ceilings and large windows. The setting allows you to feel like you are outside even though you are inside. You can sit comfortably on your couch all day in the living room, den, or dining room working on your computer or reading a book, but still feel like you’re on the beach by simply looking out your window. 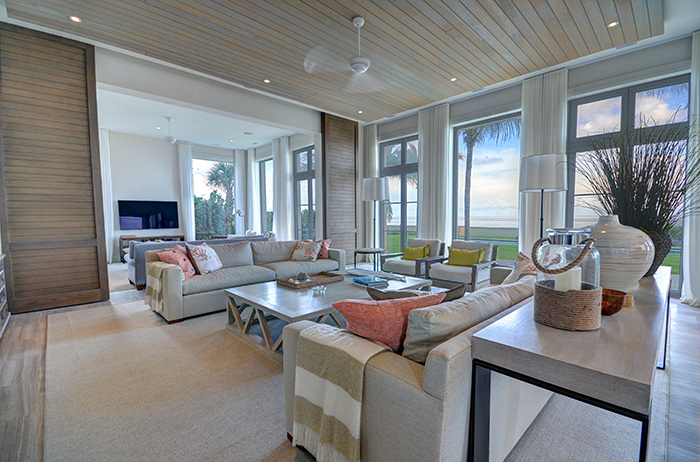 The interior of the homes is soothing with neutral beach colors (taupes, grays, whites) from the floor to the ceiling, plush couches, sliding doors to separate the den from living room and lots of tall windows. On the second floor, you will find additional bedrooms, bathrooms, custom-made Canadian furniture and organizational closets, balconies and a patio. The Beach House Villas divine services are true luxury, the kind you could expect at a high-end hotel. No request seems too large. The on-site staff is ready to assist you with your needs. Grocery shopping can be taken care of in advance. 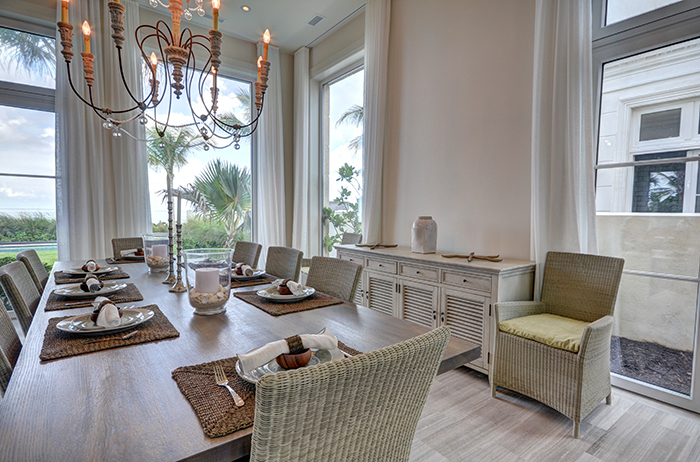 Imagine your vacation house being stocked with all of your favorite foods prior to your arrival — convenient. You can enjoy dinner on the well-groomed premises outside, perhaps a burger prepared on the beach, or dine inside at the table and take in the striking views from your large dining room windows. You do not have to worry about gaining weight while living like you are on vacation, because there is also an onsite gym within feet of each villa, complete with multiple machines, weights and a full-shower bathroom. The Beach House Villas ultimately offer an escape with the feel and amenities of a five-star hotel while providing the comfort of a home where you can relax, have privacy and even work, if need be. Fans of green living will be excited to know that in addition to their beautiful designs, these villas also have sustainable components. This luxury development utilizes its own onsite water purifying system — an important aspect as fresh water is a hot commodity when it comes to island life. All of the wastewater is recycled through this specialized purification system, rendering it drinkable. “The wastewater treatment plant from Texas purifies the sewage to the point the manufacturer claims it’s drinkable water. In fact, we don’t do that,” says Brennan. “We use the water created for landscaping. This is a great system for water re-use on a project.” There are also six cisterns that collect rainwater which are utilized for gardening purposes. In addition to incorporating reusable water practices, the architects thoughtfully designed the homes to keep electric costs down. “We have insulated the villas very well to keep air conditioning to a minimum so energy bills are also less,” said Brennan. The property comes complete with back-up generators for the common areas and for each villa, should they be needed. The Beach House Villas offer both privacy and accessibility. Located just down the beach from the Atlantis Resort, there is a plethora of activities for singles or families to enjoy on both Paradise Island and Nassau. The adventure and entertainment activities available on the island run the gamut from jet skiing, Olympic sailboating, parasailing, and swimming with the dolphins at Dolphin Cay to visiting the aquarium, theater, spa or casino at Atlantis, playing tennis, golf, fine dining, bar hopping, concerts, shows, luxury shopping and more. The island is host to multiple hotels and over thirty restaurants, so there is plenty of variety to choose from. If you want to expand your horizon, day trips are available for diving, snorkeling, fishing and island hopping. The Bahamas is a collection of over 700 islands and cays. Within thirty miles any direction from Nassau are islands that you can reach in one hour via boat. Not bad! Whether you are looking for a quiet retreat, desire a private yoga class or massage session at your humble abode or are in the mood for more island action, your private concierge at the Beach House Villas can help you plan your day. Exclusivity is valued in Nassau, and it’s a nice place for the rich and famous because it’s reportedly illegal to harass stars here (you cannot legally approach celebrities and ask to take their photograph). The eye-catching destination has been a favorite of stars who enjoy getting away from the hustle and bustle of city life. Celebrities who have purchased homes on the island include Oprah Winfrey, Michael Jordan, Chuck Norris, Sean Connery, Nicholas Cage, Tiger Woods, Elvis Presley and more. In addition to its culture and aesthetic appeal, why else is Nassau is a great place to own an island getaway? It is a tax haven that is not only beautiful, but also easily reachable. With global flights coming from places such as Canada, London, New York, Boston, Italy, Germany, Spain and China, Nassau has the number one airport in the Caribbean. The airport is clean, modern, and organized with Canadian influence from the Vancouver Airport Authority. In 2013 alone, Nassau welcomed a whopping 5.5 million visitors and that number was surpassed in 2014. One bonus of being a Beach House Villa owner is the option to receive VIP customs treatment and be expedited through the process to avoid lines. 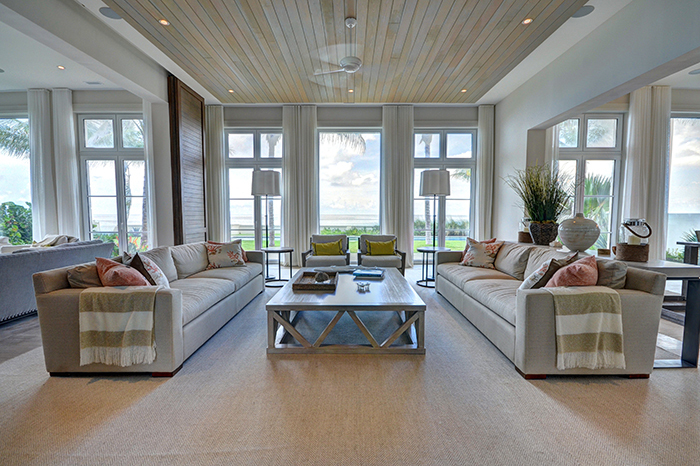 The private, world-class designed Beach House Villas joined the real estate market in the fall of 2014. With one already sold and one reserved, these exquisite stone and stucco villa homes starting from $5.5 to over $8 million are sure to go quickly. Buyers should note that financing is available for typically 50%, but some may qualify for up to 70%. The Home Owner’s Association dues are around $3,000 per month, covering the maintenance and five-star services that come with these dream homes. The taxes for are relatively low for these entities at 2% (taxes for these properties fall under $20,000; another advantage of owning property in this area is that taxes cap at $35,000). And although they were not created for this purpose, if these luxurious villas were to be rented out, they would cost between $7,000 to $10,000 per night. If sand between your toes, a tropical climate and the calming sound of the ocean factor into your ideal retreat, this might be the perfect spot for you. For what you get, this price range would be unheard of in the United States to own such prime, waterfront real estate with all its bells and whistles. From its convenient services and luxurious living quarters to its stunning oceanfront views and intimate pool settings, owners can truly experience an elevated version of island living at the Beach House Villas. For additional information, inquiries or viewing requests, visit: www.hgchristie.com/bahamas-realtor/john_christie/ and www.beachhousevillasparadiseisland.com/. DEVELOPMENT NOTE: A beautiful, sophisticated commercial project, the construction of the Beach House Villas gave back to the local economy by providing 60 jobs for local workers and highly skilled craftsmen. ABOUT BRENNAN ARCHITECTS: Highly regarded as one of North America’s premier builders, Brennan Custom Homes has built and designed hundreds of custom homes ranging from $2m to over $75m. With offices in Toronto and Palm Beach, Florida, Brennan has brought his unique eye to highly coveted homes across North America including Toronto, New York, Miami, Bermuda, Bahamas and Palm Beach. Brennan’s stunning custom works have been featured in esteemed publications throughout the years including Architectural Digest, Wall Street Journal, Miami Herald, Toronto Life and the Globe and Mail.